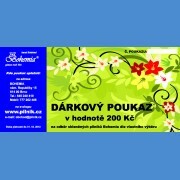 The gift voucher you can apply personally, in our salesroom or e-shop. Please write the code mentioned on the gift voucher on the note in the shopping basket. We are looking forward for your orders !